Does Touch ID for the MacBook Pro 2016 Touch Bar support elevating admin privileges in macOS? Somewhat differently, can the Touch ID give sudo access in Terminal? I'm guessing that the former may be possible, but probably not the latter since it depends on string input. I wonder this because I'm considering getting a YubiKey which can do string input to password fields, but Touch ID for Macs may render it unnecessary. 1) TouchID does support elevating privileges, but as of now, it only seems to be supported in Apple's own apps. My guess is that 3rd party apps will have to be updated to support it, unfortunately. I still end up typing in my password a lot. To allow TouchID on your Mac to authenticate you for sudo access instead of a password you need to do the following. if you click 'Cancel' you can just enter your password at the terminal prompt, if you click 'Use Password' you can enter your password in the dialog box. 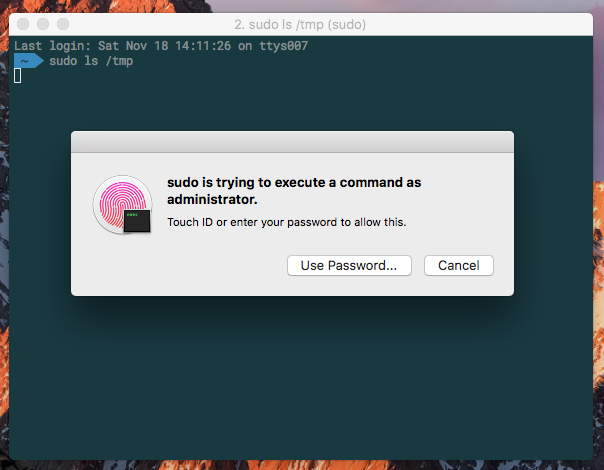 You can use fingerprint for getting sudo access in the terminal or iTerm, just add auth sufficient pam_tid.so to the first line to your /etc/pam.d/sudo file. # See: https://apple.stackexchange.com/q/259093/41827 for more info. # !~ means "does not match pattern"
This script demonstrates a few cool patterns that I love to teach people who are new to bash or DevOps. Create a backup file that is numbered rather than simply .bak on the end. (It looks gnarly, but that pattern works with whatever is in $file and is reusable. To make it safe to do curl ... | bash, wrap everything in a function and call it on the last line. That way if the download is interrupted, nothing is (partially) done. Single quoting bash heredoc 'EOF' to prevent premature shell expansion. Making inline awk more readable. If you're using iTerm2 (v3.2.8+) you may have seen Touch ID failing to work with sudo in the terminal despite having made the pam_tid.so modification as above, and it working in previous versions. This is down to an advanced feature that seems to be now enabled by default - this needs to be turned off here: iTerm2->Preferences > Advanced > (Goto the Session heading) > Allow sessions to survive logging out and back in. Not the answer you're looking for? Browse other questions tagged macos mac password touch-id touch-bar . How can I let apps make changes using TouchID on MacBook Pro? How can I adjust Touch Bar brightness? Customize touch bar button when using the browser?